During the Renaissance, the week preceding ash Wednesday (and the beginning of Lent) got the name of grasso – fat, deriving from the festive banquets organized during this period. These banquets were known for rich dishes as well as their abundance of fried sweets (more fat!) This may be seen as simply gorging before the traditionally low-fat diet of the Lenten period, but it is also true that celebrations involving lots of people made it necessary to prepare desserts that would be quick, cheap and delicious, so frying was a good way to cook lots of sweets for large crowds. And so the culmination of carnival came to be known as Martedi Grasso, Fat Tuesday. Fried sweets that appear in Italian pastry shops and at carnevale festivities include frittelle, little round fritters spiced with anise, and zeppole, made with cooked rice flavored with orange peel, shaped into cylinders, fried and then thoroughly doused with honey and dusted with cinnamon-a real digestive bomb. Maybe that’s where the tradition of carnevale fireworks comes from? 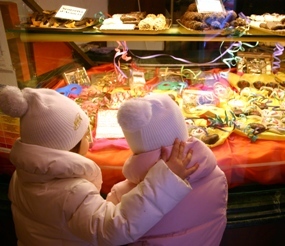 The most popular sweets found all over Italy for carnevale are chiacchiere, which means chatter or gossip, and every region seems to claim them as their own. They also change names from region to region. In Tuscany they are called cenci – rags, while in other regions they are known as lattughe – lettuce, both of which roughly describe the sweet’s appearance. In Liguria they are known as or bugie – lies, presumably because you never tell the truth about how many you eat. The recipe for chiacchiere contains a bit of alcohol, which also changes with the region. In Sicily they use Marsala, while in northern Italy they use grappa. You can use whatever you have on hand. 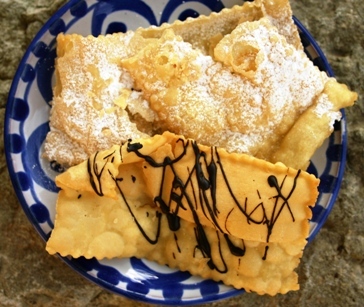 A recipe for chiacchiere di carnevale follows below. Using a serrated cutting wheel, cut the dough into strips about 3 x 5 inches, then make 2 parallel cuts within the center of each piece. Heat a pan of oil (peanut or sunflower) until about 350°F (170-180° C), and drop in a few pieces of dough at a time. Turn with a spatula. Cook until golden, then drain on paper towels. Sprinkle with confectioner’s sugar, or if you are really celebrating, drizzle with melted dark chocolate.